Discussion in 'Transformers Feedback & Reviews' started by Philister, Jul 9, 2010. 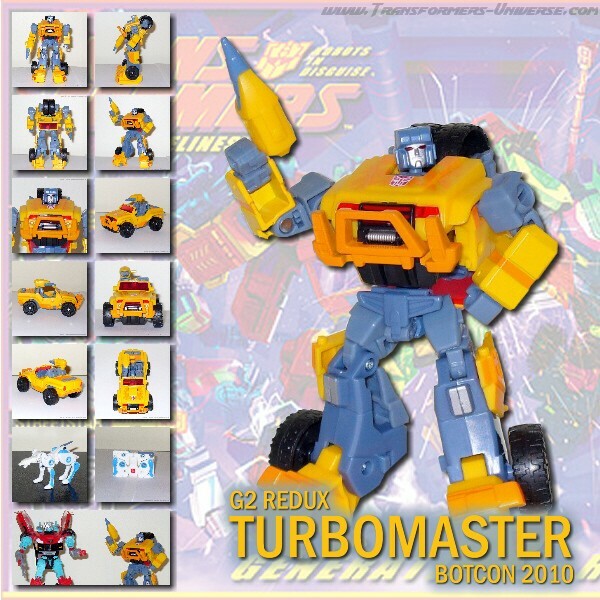 Overview: Before anyone gets upset, this figures name appears to Turbomaster because his bio card says it is. I know he is a homage to the character Scorch, who was a “Turbomaster”, but the latter was picked as his name. Regardless of the name, let’s check out this repaint of the Classics 2.0 Hound mold. Alternate Mode: The vehicle mode for Turbomaster appears to be a concept off-road vehicle similar to a Jeep. There are two basic colors, a blindingly bright fluorescent orange and a light gray. Details abound in this mode with flames on the hood, a semi-sculpted dashboard, texture on the seats and back rest, rear deck molding, and just look at the grille area. Present in the area is a brush guard, black grill, silver winch, painted fog lights, and amber plastic head lights. A neat detail is that they designed the brush guard to have gaps large enough to make the lights useful. He rolls on plastic wheels that could have used some paint. In fact, most of the superb sculpting could use just a little dash of paint as it can be boring. As with Hound his gun can be positioned on the back of either seat. Barring the lightly painted sculpting, this is a fairly decent alt-mode. I have no idea why Ravage was included with Turbomaster. I know Hound got him, but there was a “story” to support it. Anyways the white Ravage turns into a white brick (actually a cassette tape). The blue holes can mount on the rear deck of Turbomaster’s alt mode. Nice review. It took me a few takes to really like this guy, but in the end, like most of the people here, it was the inclusion of SG Ravage that sealed the deal on this guy for me. Glad I could get 2 for the price I did, he's definitely worth it. Sold off my SG Ravage, but definitely kept Scorch! I think he might be one of my favorite Botcon figs ever, right up there with 2007's Dreadwind. Definitely one of my favorites of the year. Actually, all the add-ons were stellar, minus Slice. I wasn't sure if I was going to like Scorch or not. I thought the Hound mold was a little overrated (it's cool, but it doesn't do a whole lot. And he's got short arms), and I wasn't entirely sure if I liked Scorch's character or colors... the fact that he wasn't actually G2, and we could've got Turbofire instead, just added to the sting. SG Ravage is rotting at the bottom of my Box Set and will never see the light of day. Scorch on the other had is awesome. As far as favorites go I still think It's a tie between Clench and Breakdown. Leaning more towards Clench, he's just so menacing. The chest does lock down, at least on Hound. Dunno if the tolerances have changed for Scorch at all. Just keep pushing, and it'll click in place. Got this guy earlier in the week and I am glad I didn't pass on him. Really cool paint scheme in person, on top of an already great mold. Didn't get Ravage, but wasn't really interested for the going rate. Now I need Clench to go with my Scorch and Rapido.